Dimensions 0.18 by 6 by 9 in. Amazon.com description: Product Description: The Metamorphosis is a novella by Franz Kafka. The story begins with a traveling salesman, Gregor Samsa, waking to find himself transformed into a "monstrous vermin". Franz Kafka was born on July 3rd 1883 and became one of the most influential writers of the 20th century. Metamorphosis is KafkaÃ¢ÂÂs most famous work. With William Aaltonen (other contributor) | from Chartwell Books (March 30, 2009); titled "Metamorphosis"
About: This book tells the tale of Gregor Samsa, a young salesman, who wakes up one day to find he has turned into a kind of giant bug’. About: Experience the Absurdist Genius of Franz Kafka's Greatest Work Some mornings are better than others. from Createspace Independent Pub (February 23, 2016); titled "Metamorphosis"
About: The Metamorphosis is a novella by Franz Kafka, first published in 1915. Original edition from Createspace Independent Pub (February 23, 2016); titled "Metamorphosis"
from Createspace Independent Pub (January 3, 2016); titled "Metamorphosis"
About: Metamorphosis by Franz Kafka. About: With this startling, bizarre, yet surprisingly funny first opening, Kafka begins his masterpiece, The Metamorphosis. from Createspace Independent Pub (December 9, 2015); titled "Metamorphosis"
About: Translated by David Wyllie. from Createspace Independent Pub (December 7, 2015); titled "Metamorphosis"
from Createspace Independent Pub (November 23, 2015); titled "Metamorphosis"
About: Notice: This Book is published by Historical Books Limited (www. from Createspace Independent Pub (November 11, 2015); titled "Metamorphosis"
from Createspace Independent Pub (October 15, 2015); titled "Metamorphosis"
About: Kafka‘s masterful story of Gregor Samsa is literature that still unbroken fascinates. About: One morning, when Gregor Samsa woke from troubled dreams, he found himself transformed in his bed into a horrible verminous insect. About: Gregor wakes up one morning to discover that he's become a "monstrous vermin". from Createspace Independent Pub (March 8, 2015); titled "Metamorphosis"
About: The great classic Metamorphosis by Franz Kafka. from Createspace Independent Pub (October 26, 2014); titled "Metamorphosis"
About: 'One morning, when Gregor Samsa woke from troubled dreams, he found himself transformed in his bed into a horrible vermin. from Createspace Independent Pub (September 23, 2014); titled "Metamorphosis"
About: The story begins with a traveling salesman, Gregor Samsa, waking to find himself transformed into a large, monstrous insect-like creature. from Createspace Independent Pub (September 8, 2014); titled "Metamorphosis"
About: The Metamorphosis (German: Die Verwandlung, also sometimes translated as The Transformation) is a novella by Franz Kafka, first published in 1915.
from Createspace Independent Pub (July 2, 2014); titled "Metamorphosis"
About: The Metamorphosis is a novella by Franz Kafka. from Createspace Independent Pub (July 1, 2014); titled "Metamorphosis"
About: "As Gregor Samsa awoke one morning from uneasy dreams he found himself transformed in his bed into a gigantic insect. from Createspace Independent Pub (May 9, 2014); titled "Metamorphosis"
About: Metamorphosis is a novella by Franz Kafka, first published in 1915.
from Createspace Independent Pub (January 26, 2014); titled "Metamorphosis"
About: Franz Kafka's Metamorphosis is a surreal tale that gives new depth and understanding of the word Kafkaesque; his most well-known classic, it is a must-read for modern audiences. from Createspace Independent Pub (November 20, 2013); titled "Metamorphosis"
About: “The hero of the story is called Samsa which sounds like a cryptogram for Kafka. from Createspace Independent Pub (November 5, 2013); titled "Metamorphosis"
About: Often cited as one of the most influential works of short fiction of the 20th century, Metamorphosis is widely studied in colleges and universities across the western world. from Createspace Independent Pub (October 12, 2012); titled "Metamorphosis"
from Createspace Independent Pub (October 10, 2012); titled "Metamorphosis"
About: One day Gregor Samsa, a traveling salesman, wakes up to find himself transformed into a "ungeheuren Ungeziefer", literally "monstrous vermin", often interpreted as a giant bug or insect. About: Franz Kafka's Metamorphosis is one of the great novellas of the 20th century and is widely studied in colleges and universities across the western world. 1 reprint edition from Createspace Independent Pub (October 1, 2009); titled "Metamorphosis"
About: Enriched Classics offer readers accessible editions of great works of literature enhanced by helpful notes and commentary. from Lightning Source Inc (December 31, 2007); titled "Metamorphosis"
About: Metamorphosis - Franz Kafka - Translated by David Wyllie - The Metamorphosis is a novella by Franz Kafka, first published in 1915.
from Createspace Independent Pub (January 1, 1915); titled "Metamorphosis"
About: Gregor Samsa, a traveling salesman, wakes up in his bed to find himself transformed into a large insect. Unabridged edition from Findaway World Llc (May 1, 2008); titled "Metamorphosis"
About: The Metamorphosis is a serious of stories that follow the life of Gregor Samsa, a traveling salesman. About: Franz Kafka's most famous novella is given the Critical Insights treatment in this volume. With Leroy Freeman (other contributor) | Reprint edition from Createspace Independent Pub (June 3, 2012); titled "Metamorphosis"
About: A short must read classic story. About: In graphic novel format, reworks Kafka's tale of family and alienation featuring traveling saleman Gregor Samsa, who awakens in his family home one morning to find himself turned into a giant bug. from Amereon Ltd (October 1, 1983); titled "Metamorphosis"
from Vanguard Pr (June 1, 1946); titled "Metamorphosis"
About: Franz Kafka's 1915 novella of nightmarish transformation became a worldwide classic and remains a century later one of the most widely read works of fiction in the world. 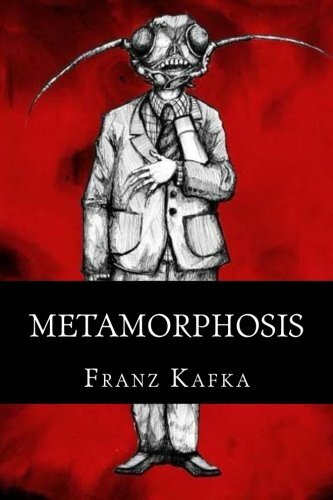 With David Farr (other contributor), Gisli Orn Gardarsson (other contributor) | from Oberon Books Ltd (August 30, 2007); titled "Metamorphosis"
About: Here is Franz Kafka’s terrifying but bizarrely comic story in a theatrically explosive new version. About: This scarce antiquarian book is a facsimile reprint of the original. With Martin Jarvis (other contributor) | Unabridged edition from Naxos Audio Books (May 1, 2003); titled "Metamorphosis"
About: A seemingly typical man wakes up one morning to discover that he has been transformed into a gigantic insect, and must deal with the depression over his new physical alteration, as well as the rejection of his family. With Martin Jarvis (other contributor) | Abridged edition from Naxos Audio Books (June 1, 2003); titled "Metamorphosis"
About: "Metamorphosis" is Kafka's most famous story. With Tom Whitworth (other contributor) | Unabridged edition from Books on Tape (December 1, 1992); titled "Metamorphosis"
About: THE METAMORPHOSIS begins as its protagonist, Gregor Samsa, wakes up one morning to find that he has become a huge insect. from Soundelux Audio Pub (January 1, 1986); titled "Metamorphosis"